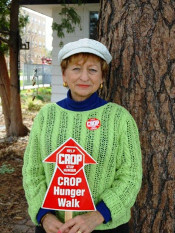 Mary Ann Sheets-Hanson grew up on a farm near Wishek, ND. After high school graduation, she became a member of the United States Women's Air Force Band. This took her to California where she lived until December 2004, when she and her husband Jack moved from Walnut Creek, CA to Valley City, North Dakota. Mary Ann earned a Bachelor of Science degree in Home Economics from California Polytechnic University, Pomona CA. She has had a variety of careers including teaching Foods and Nutrition in the Adult Education Division at Fullerton Community College, Fullerton, CA; Home Economist and Product Manager for Mitsubishi Electric, Cypress, CA; Certified Financial Planner with Lutheran Brotherhood/Thrivent Financial for Lutherans; and is the Co-Founder of the Asante Network. "Making a Difference" has been an ongoing part of Mary Ann's life and careers. Working with women in Uganda and Tanzania, has impacted and changed her life.